New model set to debut next week at 2019 Geneva Motor Show. Just last month, Lamborghini revealed a new version of its "entry-level" supercar called the Huracan Evo. 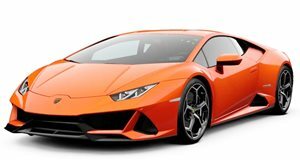 Along with some new styling, the Huracan Evo borrows its 5.2-liter naturally aspirated V10 engine from the Huracan Peformante, resulting in an ear-shattering 640 horsepower and 442 lb-ft of torque. The car also benefits from rear-wheel-steering, adaptive dampers, more aggressive aero, and a revamped interior. Any time a new supercar is revealed, it's only a matter of time before the automaker decides to chop off the roof. In the case of the Huracan Evo, Lamborghini waited just one month and has now revealed the Huracan Evo Spyder ahead of its world debut at the 2019 Geneva Motor Show. As you'd expect, the Spyder produces the same amount of power as the coupe from a 5.2-liter V10. Performance is hindered slightly due to the added weight of the convertible top but 0-60 mph still takes just 3.1 seconds (up from 2.9 in the coupe) and the top speed is 201 mph (the same as the coupe). Opting for the Spyder does add approximately 265 pounds to the overall curb weight, which shouldn't have a drastic effect on the car's driving dynamics. Lamborghini says this new car maintains the aerodynamic superiority of the Huracan Evo. With the roof up or down, the Evo still produces five times as much downforce and aerodynamic efficiency as the original Huracan Spyder. Cabin airflow has even been minimalized to create a quieter cockpit for occupants. Like the coupe, the Evo Spyder's new design maximizes aerodynamic efficiency. The new front end features a front splitter and enlarged air intakes, and at the rear a new ducktail spoiler is slotted to allow for better airflow. One of the biggest benefits of the convertible top is the ability to lower the rear window independently, allowing the sound of the exhaust to permeate through the cabin. The top itself opens electronically in just 17 seconds at speeds of up to 31 mph via a button on the central tunnel. 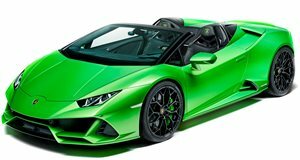 The Huracan Evo Spyder is being shown off in a four-layer paint color called Verde Selvans, which is part of an enhanced range of colors and trims available. Lamborghini's Ad Personam customization program is also available just in case the standard options just don't feel special enough. First customers will take delivery in spring 2019 and pricing in the US starts at $287,400 (around $26,000 more than the coupe).